We catch up with the typographer ahead of this year's D&AD Awards. Having designed fonts for The New Yorker, worked for Monotype, and set up his own type design studio, Dalton Maag, it's fair to say that Swiss designer Bruno Maag is something of an authority in the industry. Just don't let his dislike of Helvetica put you off. With Dalton Maag, he has worked on fonts for BMW, MINI and BT, as well as custom fonts for other companies that are still in use today. With a focus on innovative type, good craftsmanship and the psychological effects of fonts, Maag's ambitions for what lettering can achieve appear to know no limits. And this year, Maag brings all of this expertise to the D&AD awards as he judges typography submissions for the event's newly restructured craft categories. We took this opportunity to talk to him about the current state of typography, and what it takes to make a piece of typography worthy of the esteemed D&AD pencil. We recently discovered the three ways tech is changing type, but what do variable fonts and open source innovations mean for a typographer starting out in 2019? Are these changes just further challenges for a typographer to overcome? 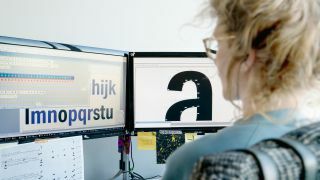 "Type, and the designing of type, has become very accessible thanks to easily available tools and software that can now automate processes that only 20 years ago had to be laboriously executed by hand," says Maag. This doesn't mean that typography as we know it is dead. Thankfully, there's always going to be room for that human touch. "Naturally, it still requires skill to draw a curve with precision, and it requires experience to understand how letterforms behave at different sizes, and that is something only a human can do for now. "This puts designers in an awkward position when thinking about their designs – is type a product, or is it an artwork that enhances and supports a greater design? I can see this struggle currently playing out in the industry and no one really has an answer." It's not all doom and gloom though. In fact technological innovations, when used right, are what excite Maag about the discipline in 2019. "Technologists are really excited about variable fonts right now because they offer reduced data load with increased access to font styles, whatever they may be," Maag explains. "Of course, smaller data volume will help fonts to establish themselves in environments that require bandwidth, like web design, but I believe that variable fonts offer far more, mostly in the areas of UI and UX, and in localisation. "Variable fonts can only be a stopgap though, and my real excitement is how we are going to look at type and typography within Virtual, Mixed or Augmented Reality." Are variable fonts little more than a stepping stone to Augmented Reality typography? D&AD's decision to reorganise its craft categories and shine a light on typography is another source of typographic delight for Maag. "Type design has become increasingly relevant within the graphic design and advertising industry in the last ten years. By having a dedicated D&AD award for typography, the industry acknowledges this most fundamental of disciplines," Maag reveals. "The fact that it is now an acknowledged discipline also means that clients will have more awareness and an understanding of the necessity of good typography for their brands and advertising campaigns. By extension, this will lead to an acknowledgement by clients of the return on investment that a typeface can bring." So what is Maag looking for as a member of the judging panel? Unsurprisingly, it's what all good typographers should keep in mind. "I would like to see a creative solution, appropriate to the purpose of the typeface," says Maag. "That means expression and personality, as long as it doesn’t interfere with conveying the message. "I would like to see type families that have been considered as a system and that can be expanded at any time, not as an afterthought, but as a design concept, whether that is with the addition of more styles, or additional writing systems. And most of all, I will not tolerate poor crafting." The D&AD Festival takes place on 21-23 May. For D&AD Festival 2019 programme details and to purchase passes, click here.